COME ON A HIKING EXPERIENCE OF A LIFETIME! Self-guided hiking experience, enjoy the thrills of camping and hiking with a little bit of help! The guide drops off and sets up all equipment and helps to prepare dinner! The support guide will provide you with all the information you need to get the best out of your hiking experience! Includes one day hot cooked lunch (excluding Lake McKenzie circuit)! Three different hiking experiences available which vary in length. Pack-free hikes are a great way to enjoy the pristine beauty of Fraser Island without having to carry a heavy pack all day! Like this idea, but don't want to camp? Want a little bit more luxury? Click here. Our pack-free camping hike experience is a self-guided hiking experience with a twist of comfort! It lets you enjoy the thrills of camping and hiking, whilst letting us pamper you a little! Experience the key sights on this short hike offered ALL year! Don’t have a lot of time!? Or just want to do a short hike, well this is for you! Our Lake McKenzie Circuit 2 day hike allows you to see the best sights in just two days. During this hike you will be able to explore the world famous Lake McKenzie, Lake Wabby and lush tropical rainforests! This hike is supported with an on-the-ground guide who will pick you up and drop you off, set up your camp and cook your dinner - what more could you want! Want to do this hike but don't want to camp, stay in our beach house instead! Enquire today! Arrive at our head office, for a short hiker briefing. The guide will then transfer the group to the first part of the walk. You will start the walk by hiking into Lake McKenzie, where you will break for lunch at the picnic area. Enjoy the stunning, beautiful white sanded beach and swim in the pristine freshwater perched lake. After lunch, you will then hike to the central rainforest area (Central Station). ​Along the way you will stop off at the pristine Basin Lake where you can take a stop and have a refreshing swim, before hiking back to camp. Marvel at huge Satinay trees growing out of the pure sand in this rainforest wonderland. When you arrive back at Central Station walkers camp your guide will have set up your camp and be waiting for you with wine and cheese! The guide will prepare your yummy dinner, which you can enjoy before falling asleep under the stars! Wake up in the beautiful rainforest, after breakfast you will walk exploring the untouched, lush and tropical rainforest, before being picked up by your guide to start the next walk! The guide will drive you to the Eastern Beach, via Eurong township and the famous 75mile beach, where you will stop along the way to enjoy your lunch in the wilderness. You will then be dropped at the Lake Wabby entrance and walk into the lake, where you can relax in the deepest Lake on Fraser Island! Once finished, you will then do a short walk to the lookout point where you can enjoy a stunning view! You will then be driven back to Kingfisher Bay Resort, where you can relax and have a nice sunset drink before boarding the barge back to Hervey Bay! Experience Fraser Islands best lakes! 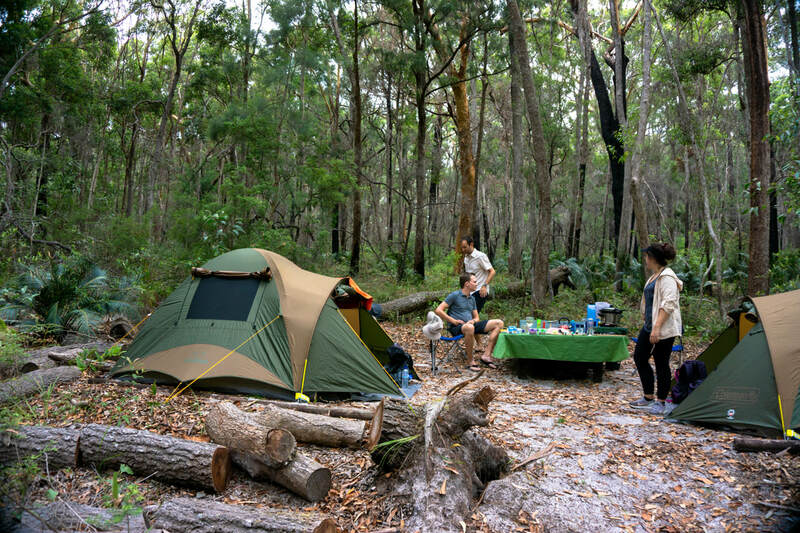 Have a real Fraser Island Eco Adventure and experience five of Fraser Island’s most beautiful pristine freshwater lakes on this, 3 day and 2 night, fully supported hike! Be transferred to the starting point of the track in comfort by one of the Fraser Dingo 4WDs. Once you head off on your walk you’ll experience bliss in the wilderness, walk through spectacular towering rainforests and swim in freshwater lakes with sandy beaches. Hike only offered from March to September due to fire danger and closures in the tracks in the summer months. This hike runs twice a month on a Saturday, Sunday and Monday. Please see the booking calendar for hiking schedules. Don't know what to bring? Scroll down to see our comprehensive list below. Wake up to the peaceful serenity of the bush, enjoy a light breakfast and morning swim in the lake before embarking on the second day of the hike. In the morning you will hike 7.5km, via Lake Birribeen to Central Station, where lunch will be provided. After lunch you will then hike 6.6km to Lake McKenzie, via Basin Lake. Once you've reached Lake McKenzie you can enjoy a peaceful afternoon swim and watch the sunset. 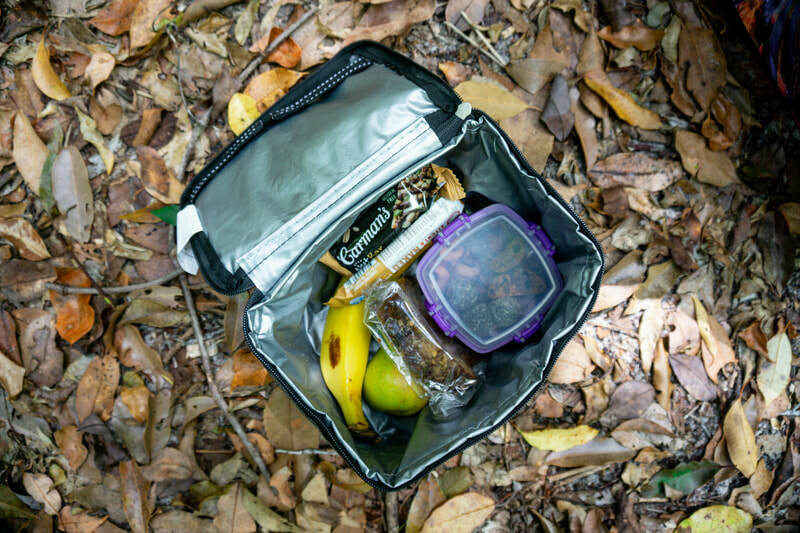 Enjoy to cook up a camp meal with all the makings provided. Wake up for sunrise on the beautiful famous Lake McKenzie and start the morning with a fresh swim and quick breakfast before beginning the last day of hiking. 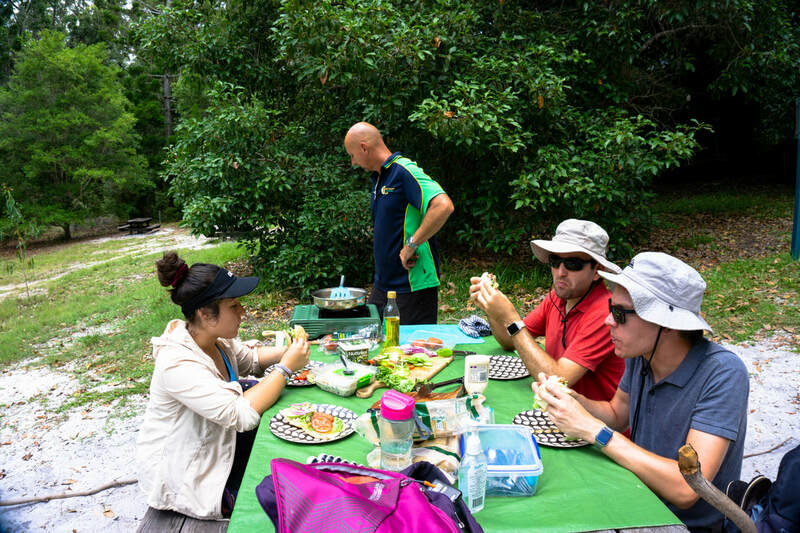 After breakfast you will hike 12km to Lake Wabby, where you can have a bush picnic lunch at the Lake Wabby Hikers camp. You will then be able to relax in the afternoon, take a swim in Lake Wabby and enjoy before returning. Hikers will do a short walk from Lake Wabby back to the Eastern Beach where the 4WD transfer awaits. The 4WD will take you back to the Kingfisher Barge landing where you will be able to enjoy an afternoon drink at the Jetty Hut before boarding the barge to return to Hervey Bay! Experience the BEST sites of ​the famous Fraser Great Walk! 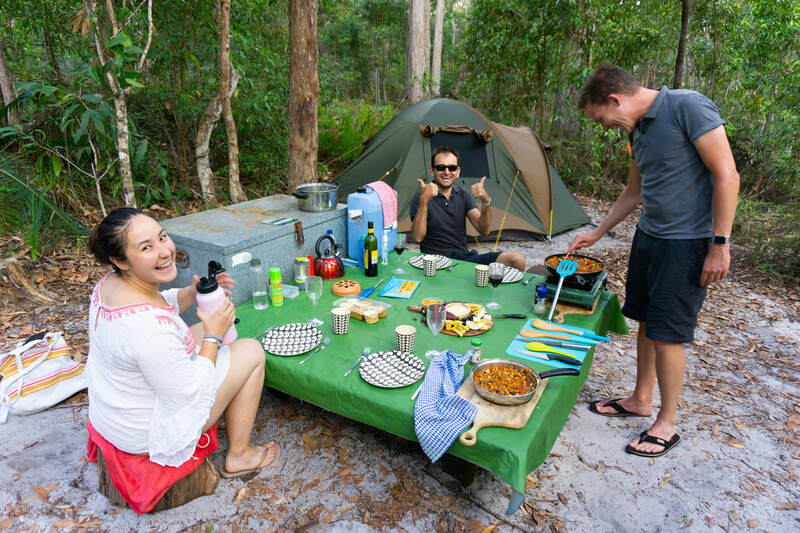 Embark upon an amazing, fully supported, 3 day and 2 night hike, where you will experience the best sights on Fraser Island. Our rainforest hike guides you through lush tropical rainforest, where you will walk under some of the largest living trees on the island in the spectacular Valley of Giants. As you walk under forest giants from location to location, you will explore sights such as incredible sand blows, the 75 mile beach and stunning lakes - Lake Garawongera and Lake McKenzie. Want to know what's included!? Scroll down for our list of what we provide! Arrive at our head office, in Hervey Bay, for a short hiker briefing. The guide will then transfer you to the island and drop you at a point along the Great Walk! track where you will begin the hike. ​The hike is takes you up through magnificent rainforest, and lust tropical landscapes to the Valley of the Giants. Along the way you will be able to undertake two side walks. The first will take you to the Badjala Sandblow and the second is the Giant Satinay tree walk, where you will be able to explore one of the oldest living trees on the island! ​Note: there is composting toilets and running water near the walkers camp but there is no showers. Wake up in the lush rainforest, among the tallest trees on the island as you begin your morning with a fresh breakfast, before you head off on a short walk, 2.6km, to see the Tallowood tree - one of the biggest and oldest trees on the island! After this you will then embark on your walk to the stunning, tea-tree infused Lake Garawongera. There is an optional historical site along the way, 1km, into Petrie’s Camp, which we recommend! 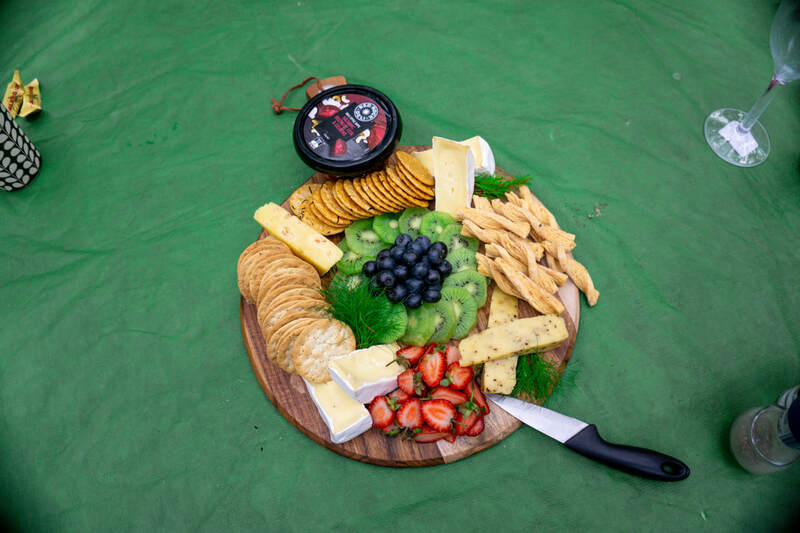 When you arrive at camp, you will be met by your guide who will have set up camp, with wine and cheese waiting for you in the mesmerizing rainforest! Enjoy a nice dinner with your fellow hikers before a good night's rest. Note: there is composting toilets and running water near the walkers camp but there is no showers - but there is a lake! Have a refreshing morning swim in the lake before setting off on your last day of hiking. You will walk from Lake Garawongera to Happy Valley, on the Eastern beach, where you will meet your guide. You will then be driven down the famous 75 mile beach, through Eurong to Central Station, where you will stop to enjoy your lunch. After lunch you will then hike through to Pile Valley where your guide will transfer you to another meeting point along the great! walk track where you will walk into Lake McKenzie to the secret hikers beach. Here you can enjoy and relax on the beautiful white sanded beach and swim in the pristine freshwater perched lake. The guide will then pick you up and drive you back to Kingfisher Resort where you can relax at sunset, over a drink before heading back to Hervey Bay. Tents and equipment - sleeping bags, comfy sleeping mats, camp pillows & pillow slip. Please note our prices are based on twin share - 1 tent set up for 2 persons, if you require otherwise please let us know, there may be a charge for requiring a single tent). Torch - head torch is recommended (we provide small lanterns around camp). Hike departs from the Fraser Dingo 4WD Adventures office in Urangan, Hervey Bay, at approx 8am for your 4WD transfer to the Island (If you have pre arranged, it is possible to get a pick up from your hotel/ hostel in Hervey Bay *may cost extra). The 4WD transfer goes from the Fraser Dingo 4WD Adventures office to the River Heads Barge and then onto Fraser Island to your hiking destination. Min. 50% payment to secure booking, full payment required 30 days before departure. 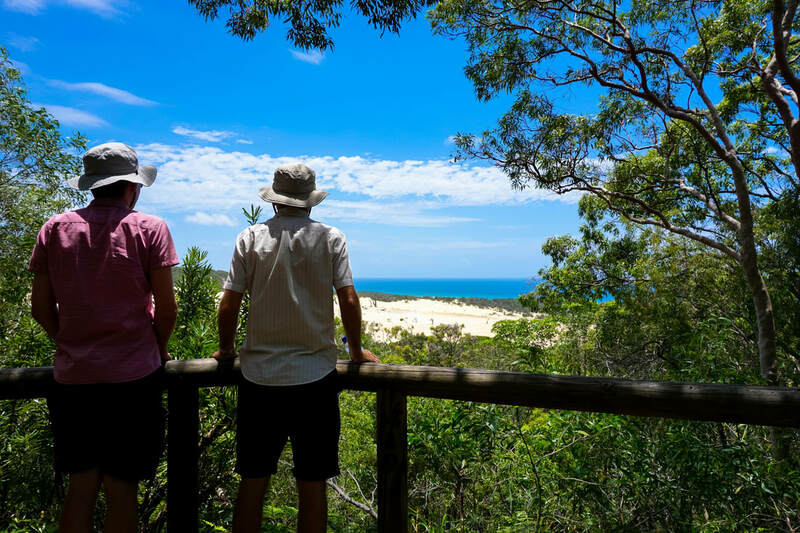 Hiking on Fraser Island is subject to the Great Walk hiking tracks being open, keeping the tracks open is based on a precipitation level, due to fire safety. This is monitored by Queensland National Parks, as they can close the hiking tracks with little notice especially in the warmer months of Nov - March, therefore we only run this hike from March to October to ensure safety and confirmation. However in the event of a track closure or dangerous weather conditions, beyond our control, Fraser Island Hiking will offer a full refund or an alternative option (such as a 4WD hire or tag along tour - costs may apply). Customer cancellations less than 30 days prior to the hike date are not refundable - cancellations more than 30 days are refundable but will incur an admin fee of $50.